Portland cement is a finely ground material. It, therefore, readily absorbs moisture even from the atmosphere. It is therefore essential to protect it from dampness during storage. Lack of proper care may cause setting of cement or reduction in its strength due to partial setting. (i) Walls, roof and floor of the building in which cement is to be stored should be completely waterproof. (ii) In case the cement store is newly constructed then its interior should have been thoroughly dried before cement is stored in it. (iii) Doors and windows should be properly fitted and should be kept shut. (iv) Except in case of dry concrete floor the cement bags should be stacked on wooden planks. (v) The bags should be stacked away from walls. A space of 25 cm all around should be left between the exterior walls and the piles. (vi) Bag should be piled close together. (vii) Bag should be piled in header stretcher fashion and not more than 15 bags high. (viii) While removing cement cement from store do not take out bags from one tier only. Step back two or three tiers. (ix) Each incoming consignment should be stacked separately and a placard bearing date of arrival of the consignment should be pinned to it. This would help in using cement in the same order as it arrives thereby avoiding dead storage, that is a stack remaining in position for a long time while other consignments of cement come in and go out. 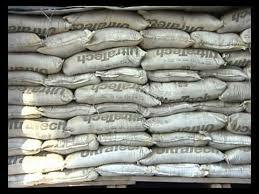 (x) For temporary storage of cement at site of work, bags should not be stacked on the ground. Minimum number of bags needed should be piled upon raised dry platform and covered with tarpaulins.